Calgary's 420 Music & Arts Festival is set to return to the city for its third edition this year, and organizers have now revealed the musical lineup set to play this year's event. 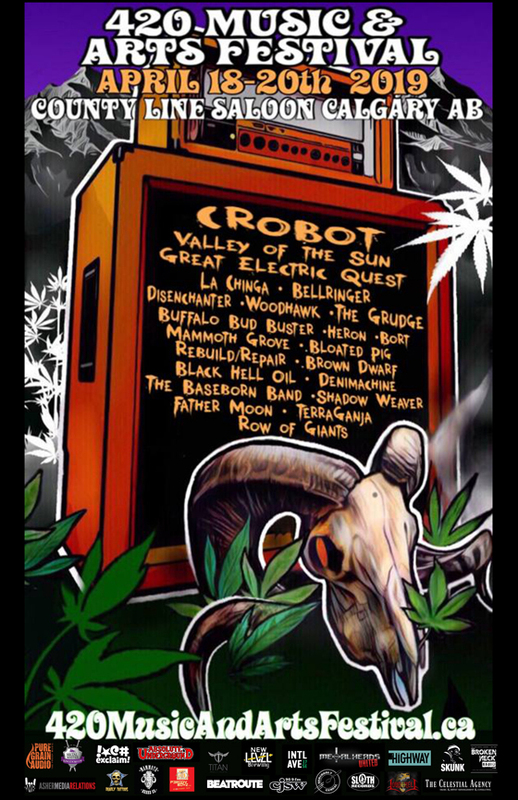 Pennsylvania outfit Crobot top the bill, followed closely by Valley of the Sun, Great Electric Quest, La Chinga, Bellringer, Disenchanter, Woodhawk, the Grudge, Buffalo Bud Buster, HERON, BORT, Mammoth Grove, Bloated Pig and more. For its third year, 420 Arts & Music will also boast its own beer brewed in collaboration with sponsor New Level Brewing. While it will be available during the three-day event, a launch party will be held March 29 with music coming courtesy of Calgary trio Hypnopilot. Further details on the launch event can be found here. This year's 420 Arts & Music Festival runs April 18 to 20 at Calgary's County Line Saloon. A full festival pass is available for $60 in advance, with single-day tickets and additional options available. You can find further details through the festival's official website.